Honor was wearing Flower Tank Top and Peach Crop Cardigan (first seen on April 30th 2009) both by Mamas & Papas UK, while heading to the park on October 1st 2009.
info: Pink Bloomers by Lola et Moi; Hair Clip by Creative Clips. Honor was wearing Navy Crochet Trim Romper by GAP (first seen on August 28th 2009), while lunching with her parents at Griddle Cafe in LA, on October 3rd 2009. 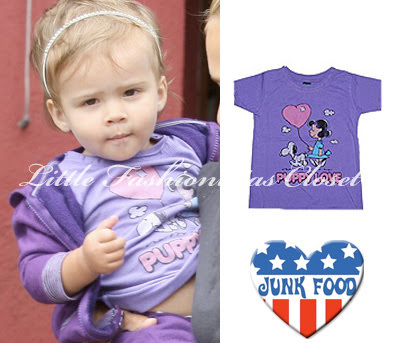 Honor was wearing Purple Puppy Love Tee by Junkfood for GAP (first seen on July 30th 2009); while leaving a deli in Beverly Hills on October 4th 2009. Honor was wearing Silver Sparkle Shoes by Converse, while out with her nanny in LA on September 29th 2009.
please, leave a comment if you know the designer/brand for Honor's hoodie. Honor was wearing Madras Cami by 77Kids/American Eagle (first seen on September 3rd 2009) and Crop Denim Jacket with cute "POLICE" patch, while grabbing breakfast at the Urth Cafe on September 30th 2009. Honor was wearing Madras Cami by 77Kids/American Eagle, Cool Super Hero Cape by Cutie Pa Tutus and Silver Kaitelyn Shoes by Pediped (first seen on June 30th 2009); while arriving at LAX airport on September 3rd 2009. Honor was wearing Peach Crop Cardigan by Mamas & Papas UK (first seen on April 30th 2009) and Zoe Metallic Pink Mary Janes by Pediped (first seen on April 1st 2009); while shopping at The Grove in West Hollywood on September 18th 2009. Honor was wearingYellow Embroidered Top by Mamas & Papas (first seen June 28th 2009) and Olivia White Shoes by Pediped (first seen on May 15th 2009), while strolling in Beverly Hills on September 19th 2009. Honor was wearing White Pearl Monstein Sandals by Birkenstock, while going through LAX Airport on August 3rd 2009. Honor was wearing White Berry Dress by Bonpoint, first spotted on June 27th 2009.
info: Flower Headband by Crewcuts. Honor was wearing Navy Crochet Trim Romper by GAP, while leaving Urth Cafe on August 28th 2009. Honor was wearing Bella Morning Gown by Strasbourg Children and White Pearl Monstein Sandals by Birkenstock, while out for breakfast at Jinky's Cafe on August 30th 2009. Thanks to Leslie for the dress id! Honor & Jessica were spotted shopping at Bel Bambini store on July 29th 2009. Silver Kaitelyn Shoes by Pediped, first spotted on June 30th 2009. Honor was wearing Purple Puppy Love Tee by Junkfood for GAP, while out in West Hollywood on July 30th 2009.
shoes info: Metallic Baby Tracks by Trumpette. 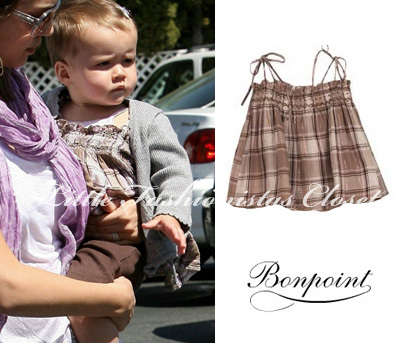 Honor was wearing Liberty Print Tank Dress by Bonpoint, while shopping at Bel Bambini in Beverly Hills on July 7th 2009. Honor was wearing White Swiss Dot Romper by Marie Chantal, while strolling in NYC on July 17th 2009.
shoes info: Silver First Walker Shoes by Naturino. Honor was wearing Tank Top & Bloomer Set by Marie Chantal, while out in NYC on July 18th 2009. Honor was wearing White Berry Dress by Bonpoint, while shopping at Barneys on June 27th 2009. Honor was wearing Yellow Embroidered Top by Mamas & Papas, while out for lunch in Beverly Hills on June 28th 2009. Honor was wearing Silver Kaitelyn Shoes by Pediped, while out on June 30th 2009. Honor is also wearing cute star print shorts! please, leave a comment if you know the designer/brand. Honor and her parents spent a fun day at the beach on the 4th of July in Malibu. Honor was wearing Blue Skies Top by Janie and Jack, first spotted on June 12th 2009. 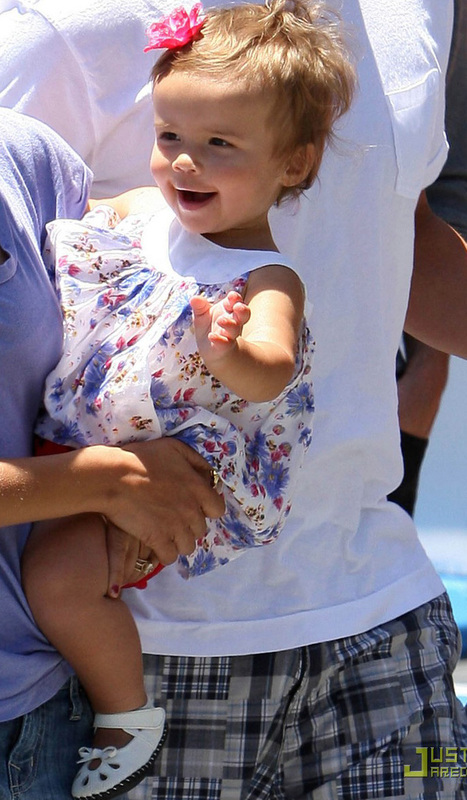 Honor and her parents went to lunch at Jinky's Cafe in West Hollywood on July 6th 2009. Honor is wearing an adorable dress, please leave a comment if you know the designer/brand. Shoes info: Olivia White Shoes by Pediped, first spotted on May 15th 2009. Honor was wearing Billy Jeans by True Religion, while out with her parents in Santa Monica on June 6th 2009. Honor and her parents attended a friends wedding in Paris, France on June 11th 2009. Honor was wearing Olivia White Shoes by Pediped, first sported on May 15th 2009. 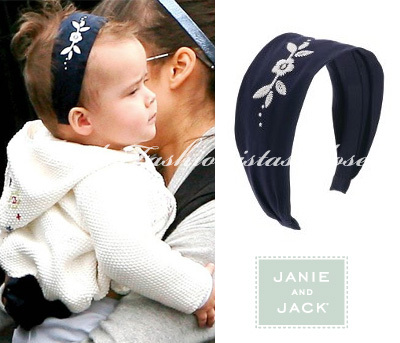 Honor was wearing Navy Embroidered Top & Headband from Blue Skies line by Janie & Jack, while out sightseeing wiht her parents in Paris, France on June 12th 2009. The headband was first spotted on February 8th 2009. Honor was wearing Ribbed Cardigan, Liberty Print Dress and Bow Headband all by Bonpoint, while out in Beverly Hills on June 21st 2009. The dress was first spotted on April 19th 2009. Honor was wearing White Isabella Shoes by Pediped, while shopping in Beverly Hills on May 8th 2009. Honor was wearing Silk Smocked Dress by Bonpoint and Flower Headband by Crewcuts, while going out for Mother's Day lunch on May 11th 2009. Honor was wearing Olivia White Shoes by Pediped, while heading to Le Pain Quotidien on May 15th 2009.